Celebrities are THE fashion icons for beauty, makeup — and of course, hairstyles. Iggy Azalea is no exception. That’s why we’ve got Iggy Azalea photo galleries, pictures, and general beauty news on this celeb. Her style is totally inspiring and worth checking out. So if you’re searching for some beauty tips, hairstyle options, and fashion advice, turn to Iggy Azalea. She’ll bring your fashion to a whole new place. 1. 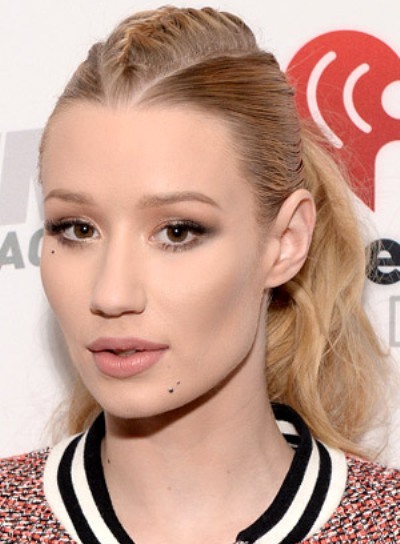 To get Iggy Azalea’s hairstyle, start by applying a shine serum to damp hair. 2. Rough dry with a blow dryer, using your fingers to add texture. Part your hair in the center. 2. Spray a dry texturizer throughout hair, starting at eye level. 1. To get Iggy Azalea’s hairstyle, apply a volumizing mousse to damp hair and blow dry, using your fingers to add texture. Part your hair in the center. 2. Spray your hair with heat protectant and curl 1-inch sections with a 1-inch curling wand. Alternate directions for a natural look. 1.To get Iggy Azalea's hairstyle, start by applying a texturizing powder to unwashed hair to give it some grip. 2.Take a small section at the center of your head and French braid half the length. Securing with a clear elastic. 3.Spritz your hair with hairspray, and then pull your hair into a ponytail, using a fine-toothed comb to smooth the sides.